Exactly one week ago, as I sit here this evening and type this blog entry, I was sitting in the bar at the Grafton Hotel, London, with one of the most important figures in pop music history. He's not necessarily a household name - although that depends on your household - but behind the scenes he helped to change the direction of contemporary music and is listed as a co-writer on what musicologists acknowledge as some of the music important songs ever recorded. Alfred 'Pee Wee' Ellis will turn 70 in three months time. Born in Florida in 1941, he was a professional sax player by the time he reached middle school and at age 16 trained under jazz legend Sonny Rollins. In a career now entering it's seventh decade (he began working in the 1950s and has a new album due in 2011) he has released a succession of solo albums and has arranged for everybody from George Benson to Van Morrison - but he's best known for his work with the Godfather of Soul, James Brown. 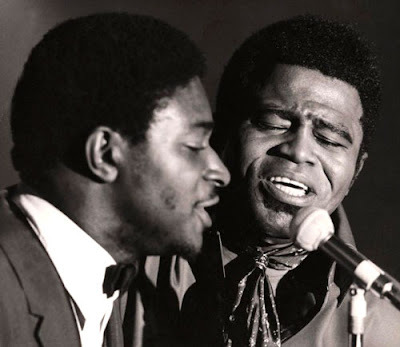 Ellis joined Brown's band in 1965 thinking he'd earn enough money with the superstar to allow him to play jazz in his time off. Little did he know that his creative partnership with Brown would spark a music revolution, becoming one of the most significant milestones in the evolution of pop music and providing a soundtrack for the emancipation of black America. Perhaps the most celebrated of Ellis's collaborations with Brown is Cold Sweat, considered by many to be the first example of pure funk music. Relaxing after a gig one night in May 1967, Ellis - who had become Brown's arranger a year earlier - was called to the boss's dressing room. Brown had a groove in his head, a staccato bass lick, and wanted Ellis to see what he could do with it. On the tour bus the next day, Ellis built a song around Brown's bass lick, the horn section inspired by Miles Davis's So What but stripped of melodic flourishes in accordance with Brown's directive that his band should 'play every instrument like it's a drum'. Ellis took the band to the studio, taught them their parts and awaited Brown's arrival. When he appeared Brown tinkered with the arrangement. "He changed the guitar part, which made it real funky," Ellis once said, "and had the drummer do something different. He was a genius at it. Between the two of us, we put it together in one afternoon. He put the lyrics on it. The band set up in a semi-circle in the studio with one microphone. It was recorded live in the studio. One take. It was like a performance. We didn't do overdubbing." In the ensuing years Ellis co-wrote some of Brown's most sampled grooves including Mother Popcorn, Licking Stick-Licking Stick and the groundbreaking Say It Loud (I'm Black and I'm Proud), which was inducted into the Rock & Roll Hall of Fame as one of the 500 songs that shaped rock & roll music, and listed by Rolling Stone magazine as one of the 500 greatest songs of all time. After leaving Brown in 1969 Ellis joined Kudu, a CTI Records imprint, where he worked as an arranger for artists including George Benson and Esther Phillips. In 1972 he and his band recorded an album - Pass The Butter - on Motown's Natural Resources label, under the name Gotham. His first solo album, Home In The Country, was released in the mid-1970s and his solo career, which has spanned jazz, funk and gospel, continues to this day with a new album due in March 2011. I met up with Pee Wee ahead of a gig at Ronnie Scott's, the legendary Soho jazz club. Sipping tall orange juices and surrounded by the swirling jazz soundtrack in the bar, we spoke for an hour and a half about his lengthy career. Although reticent at first, Pee Wee was soon laughing and joking about the glory days in Brown's band as we recalled excerpts from Fred Wesley's hilarious memoir, Hit Me Fred: Confessions of a Sideman. During our interview we also spoke about Pee Wee's life and career both before and after his stint in the James Brown band; how he wound up studying under Sonny Rollins, the culture shock of being given so much creative freedom at Kudu, why he decided to flee New York when the city went up in smoke during riots over racism and police brutality, and how he fell in love with a fan at London's Jazz Café and left America to live in the British countryside. Pee Wee was both a witness to and an important part of arguably the most important musical shift of the 20th century, rivalled only by the invention of rock & roll. It was a pleasure and a privilege to spend an evening chatting and laughing with Pee Wee after enjoying his music for so many years and a unique experience to have him transport me back to the era, sharing his first hand recollections of life on the road and in the studio with James Brown. A book from Pee Wee is long overdue but he tells me he's quietly writing his life story with a view to publishing it at some point. In the meantime, I look forward to sharing with you the recollections that Pee Wee shared with me. 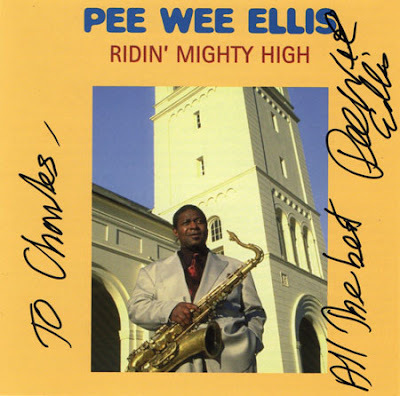 My exclusive interview with Pee Wee Ellis will be published in the coming months.